Slab building is one of the most exciting ways to make work with clay. And if you prefer more instant gratification than you can get from a wheel, slab building is a great way to go. Finding slump and hump molds in interesting shapes at thrift shops and dollar stores is a great way to build with slabs. 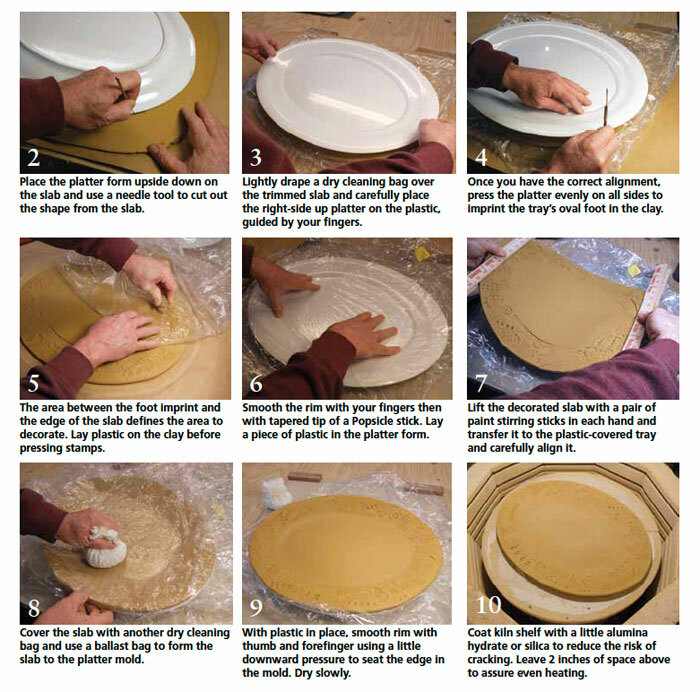 In today's post, an excerpt reprinted from Daryl Baird's popular book From a Slab of Clay and reprinted in our latest free download A Guide to Slab Rollers Tips for Buying or Building a Slabroller, and Three Slab Pottery Projects, Daryl shares a simple platter project from a found slump mold. - Jennifer Harnetty, editor. Traditionally, platters have been made by laying a large slab of clay into a large, shallow mold and trimming the edge in the same way the excess dough is trimmed from the crust of a pie. This demonstration presents an alternative approach—the slab is trimmed and its edge finished before it’s placed in the mold, and all of the decorating is done while the slab lays flat on the table. Step 1. Roll out a slab of clay on construction paper just under ½ inch thick. Spray water on the surface and smooth it. This demonstration is one of 16 how-to demonstrations in Daryl Baird's hot-selling book From a Slab of Clay. For more interesting slab roller techniques, download your free copy of A Guide to Slab Rollers Tips for Buying or Building a Slabroller, and Three Slab Pottery Projects. clay, slabroller, slump mold, trimming. Nancy – I think the directions make it seem a bit more difficult than it really is, but it’s also hard to describe in words. On the bottom of the mold, there is a rim at the point where the flat portion (that sits on the table) and the edges (that angle up) meet. The mold was pressed onto the slab, to find that bottom rim. The rim indentation in the clay served as a guide to stamp/decorate. Does that make sense? If I had a round slab and was going to make a slump bowl, I would take something (tupperware, jar), turn it upside down, and press it gently in the middle, so when I flip the slab over to rest on the top of the jar, I don’t have to move the slab around to find the center. It also shows me where the base ends and the walls begin. Hope this helps. I am still confused. Does the clay platter have a foot? When the mold plate is placed on the clay right side up, is that to see where the plate lifts into,the rim? I don’t get this part at all! I am spatially challenged! I use only hand-building techniques and slab-bowls constitute a huge proportion of my pieces (www.facebook.com/potterybyashleyhakes). Almost anything can be used for support while drying (in addition to thrift stores, I’ve found great tools at dollar-stores). I tend to initially suggest that folks try the outside of various bowls, tupperware, etc. Just ensure the edges are covered tightly to prevent cracking and dry it in a controlled manner. There are ENDLESS possibilities with slabs! I have found some great trays for patterns, etc…on sale after Holidays. Lots of larger sized plastic ones, and some with dividers. Some grocery stores make up fruit or veggie trays for take-out that can be patterned and quite interesting in clay! Bonnie – you can do ‘Print Screen’ button and copy it to ‘paint’ then choose just the pictures and text and copy that to word and you can make it as big as you like. That’s what I do to keep a copy for myself and it works fine. Hope that helps. Alway like more ideas for teaching slump molds at my senior center. Really like the idea of coating a thin layer on the shelf to reduce risk of cracking. One comment about the images. I went to print a copy of the lesson and could not print one that could be read on paper. This is important when there is no internet in the classroom. I’ve been working with slabs of clay since 1980…or maybe it was 1979..anyway, I like the idea of accentuating the foot from the mould…..I have done that with small pieces but nothing large…cos I don’t have any kind of mould with a foot….lol. For those who may be new to slab work, thrift stores are a great place to pick up wooden bowls to be used as moulds…you can use either the inside or the outside. I work primarily with porcelain and mason stains. I was just looking at platters on another website, and was thinking about making a couple of them. I didn’t want to throw them, so was thinking about hand-building. Perfect timing, great pics, and instructions!